Have you ever wondered about the lives of the people who are the same age as you, but live in rural regions? The answer might seem quite clear just at first thought. They generally have lower living conditions than those living in the cities. But most importantly, there is a huge gap between the education programs existing in schools in cities and rural areas. Chinese students have always ranked in the top percentile of the world. According to the Shanghai high schoolers, Shanghai students had ranked best in the science, reading, as well as math sections out of all students from 65 different countries. But even in a nation like this, there is a large disparity in the quality of education that citizens receive. And this gap already existed at the very start of Chinese primary school. Students in cities get to train their brains and explore their imagination by learning different varieties of subjects, such as English, math, science, and etc. On the other hand, students live in rural areas have cramped dormitories, fewer choices of subjects with lower quality, as well as longer time to go to their school as they face obstacles on their way to the school, like the mountains. My name is Mengzhen Lian, a Junior at the Jakarta Intercultural School. My relationship with music began since I was 5 years old. I joined the school band in 6th grade, and also took many classes related to music. The inspiration for me choosing education as the topic was that although I currently live in Indonesia, but my hometown is Shenzhen, China. China undoubtedly is a powerful and huge nation, but the separation of economic classes in the country is also large. I have relatives and friends who initially come from rural areas to study in the cities. From communicating with them, I acquire the difficulty in having a good quality of education in countrysides. Fortunately, the Chinese government had noticed this huge gap in the urban-rural education gap. After analyzing this issue carefully, the government decides to tackle the problem using several methods: Teacher support programs, provide more fundings of senior secondary schools, and help people to develop job skills. Support programs – Teacher supply has always been a critical issue in rural areas, therefore the government decides to expand teacher support programme in the villages. 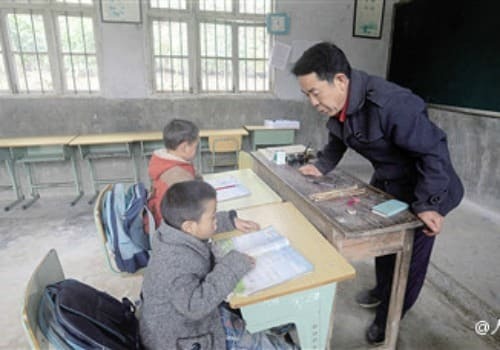 Teachers’ salaries has increased from 300 yuan to 1500 yuan per month. Not only that, the government also provides money for building a better living condition for the teachers. Senior secondary schools – It is very common that children in rural areas will skip school after the mandatory school levels. Therefore the government is trying to make sure that these people have the opportunity to go to vocational schooling. This fund provided by the government has actually boosted the number of students from rural regions enrolling in colleges. Job skills – One of the main reasons for why poor are not employed is that they are not educated enough to preside valued job skills. Thus in order to solve this problem, the government is thinking about providing training programs in villages on certain skills, such as basic engineering. By doing this, it will enable the lower income earners an opportunity to develop more valued skills so they could be employed as soon as possible. Below you can hear my original music composition that is based on the theme of education equality. Great composition! It does sound like the philosophy and culture of education! It makes me think of progress, and the promise of equality and equity that education can continue to strive for. Amazing composition! I like how you made the topic regional to your country. Thank you for sharing conflicts that are not only global but affect people we do not know about. This is such a great piece! The song is beautiful; I think that it captured this topic very well. Hello! I was not aware of the issue of rural/urban disparities in Chinese education, and you explained it clearly. Could you maybe explain the symbolism of the composition as it relates to educational inequality? Hello! I am currently in AP Chinese, and we just studied this topic. The information in here is presented accurately, and this was great review for the upcoming AP test. Your piece is very beautiful and I can hear its connection to the topic. Well done!